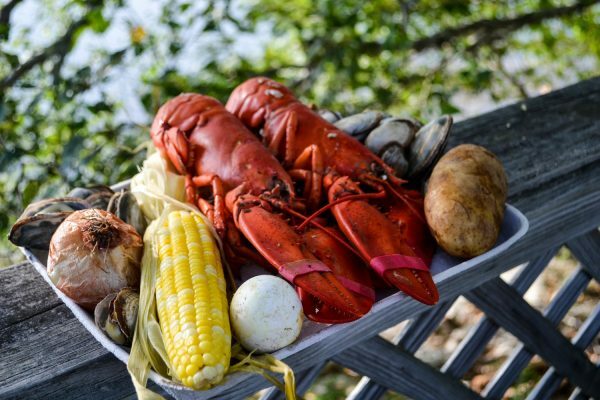 Your Downeast Clambake adventure begins with a scenic tour of Boothbay Harbor aboard the Bennie Alice, en route to 5 1/2 acre cabbage Island in Linekin Bay. There, a succulent feast of Maine lobsters and clams with all the traditional fixin’s awaits you. Cabbage island has been the home of traditional clambakes in 1957 ad your hosts, the Moore family, cordially welcome you to experience this Downeast tradition! This authentic meal includes a steaming cup of traditional New England Fish Chowder, two luscious bright red lobsters, tender white steamed clams, sweet golden corn on the cob, egg, onion, and potatoes. For dessert, you will love our famous Blueberry Cake and hot fresh coffee and tea.